Cover painting by Dominic Harman. 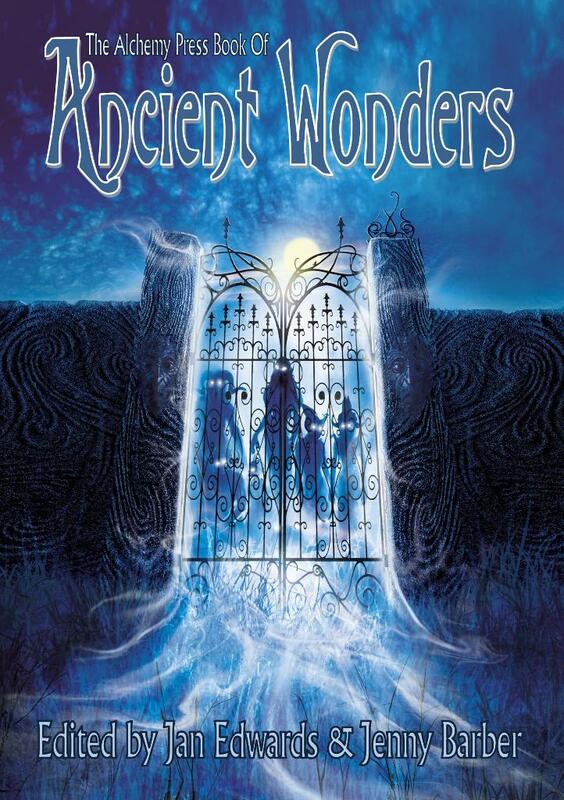 The Alchemy Press Book of Ancient Wonders is just £10 or $15 and is available from Amazon UK, Amazon USA, Barnes & Noble or The Book Depository. The Kindle edition is available from Amazon UK and Amazon US. The ePub version can be obtained from Weightless Books. “Being an old alchemist myself who took some time to get over the phlogiston theory, I was intrigued to see what was going on at The Alchemy Press. If you have not encountered them before, I would check out the website. This isn’t a weird and wonderful collection of 1960s hippies with crystals, wind chimes and astrology charts. Nothing like that here! Rather, it’s a site where you’ll find lots of interesting collections of stories and articles which have as a basis our past, our culture and the more mysterious aspects of our lives. I was actually quite impressed! This particular collection contains 14 stories which have as their basis our history, sometimes with archaeological connections and stone circles with Celtic beginnings. You’ll be travelling back to ancient Rome, New York and even an Ithaca in space. However, the main link between all the stories is the quality of the writing which is very good. In selecting the works, the editors must have looked to readability as a major facet. They are all certainly very readable. To give an example, “If Street” by James Brogden is all about a couple of childhood friends living near the site of a Roman settlement in Britain. As boys who investigated everything, they were intrigued by an old Roman road. One of the characters disappeared, to come back many years later. He had been living in the past as a Roman soldier fighting against invaders. Bryn Forley’s “Ithaca Or Bust” is a parody of the legend of Troy, only the characters are vastly different. Taking place in a stellar empire, the beings have two heads, four arms and legs and are about five metres tall. Much of the conversation is between the two heads, one logical and thoughtful with the other forthright and adventurous. It makes for interesting reading. “This is another one of those reviews that has taken a lot longer to get round to than I had first imagined. The reason for this is I think that ancient wonders contained within its pages were conspiring to make my life difficult. During my time reading this anthology the book decided to disappear. I hunted high and low looking for this book, and both times it mysteriously appeared on a book shelf that I checked at least twice. Trust me, there are strange and wondrous powers working within this book. With a title like this, you would hope that the stories contained within are ones that will elicit a feeling of joy and wonder, and perhaps a few that are tinged with a slight darkness. Thankfully, the anthology does this with great aplomb. The stories on offer are of an extremely high standard in terms of the quality of writing but more importantly they have that magic edge that makes them special. That ability that brings a wide-eyed smile to your face. A lot of the stories have similar themes, of time travel, the ancient world impinging on ours, and the legends of old, but each story lives out it’s own fabulous world in the anthology. The opening story, “Bones” by Adrian Tchaikovsky, is a brilliant story of an archaeological dig for some monstrous bones, and that has a fabulous and subtle twist to the tale. Adrian packs a lot into this story, to the point that you get a real feel for this futuristic society of… Well you’re going to have to read the book to find out what they are. Following on from this is perhaps my favourite story of the anthology: “If Street” by James Brogden. This story will strike a perfect chord with every male reader; don’t lie, I know everyone of you dreamed of being a Roman soldier as a kid, and probably still do. “If Street” reads like one of those classic Sunday afternoon dramas: there is wonder, danger, sadness and the loss of childhood innocence. It’s also full of great ideas, such as what happens to the Romans when they make the journey across the veil into our world. Excellent stuff. William Meikle’s “The Cauldron of Camulos” is a rip-roaring take on Arthurian England, told with Meikle’s spectacular gift to entertain the reader. Peter Crowther’s “Gandalph Cohen and the Land at the End of the Working Day” is one of those unusual stories that in theory shouldn’t work, but somehow manages to be one that is just pure genius.